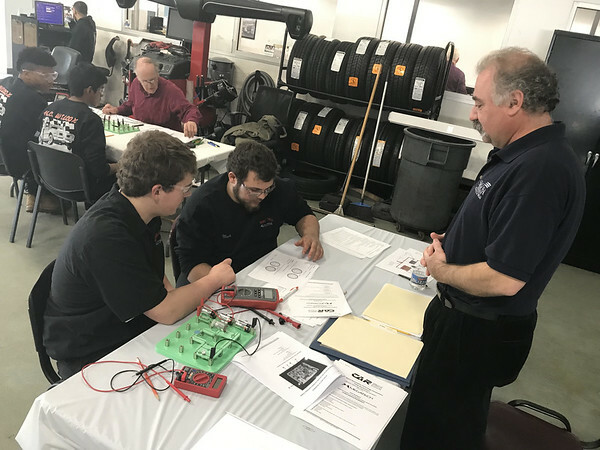 PLAINVILLE - Crowley Ford saw several area manufacturing students competing under the guidance of retired industry professionals to diagnose electrical problems and other issues with cars Tuesday. The event was sponsored by the Connecticut Automotive Retailers Association and facilitated by the Connecticut Technical Education and Career System. Larry Eiden, coordinator with the Connecticut Automotive Retailers Association, explained that winners had a chance to qualify for a national competition which will be held in New York City April 23 and 24. First through sixth place winning teams of that competition have a chance to earn between $1,000 and $10,000 in scholarships. “They are assigned to work stations where there are bugs and defects with cars or circuits that they have to diagnose, repair or solve,” he explained. Lou Camacho, education consultant intern with Connecticut Technical Education and Career Systems, said that this competition has been held for more than 20 years. Participating students took an ASE (Automotive Service Excellence) standardized test and scored highly. Eighteen schools in the area would be participating over the course of the day. 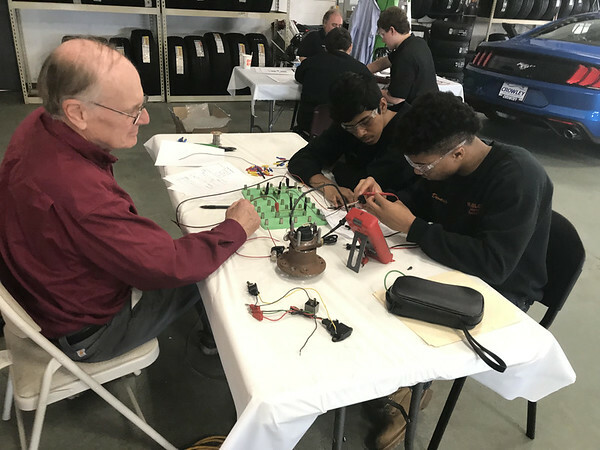 John Moss, a retired Saab technician with more than 37 years of experience in the industry, helped students Devario Reid and Cruz Leon from H.C. Wilcox Technical High School at one station. At another station, Abraham Basmajian of Megatech Corporation from Massachusetts oversaw Mark Wheeler and Austin Smith from Norwich Tech as they worked on a “basic electrical trainer.” He explained that his company manufactured these training devices so that students could get practice. 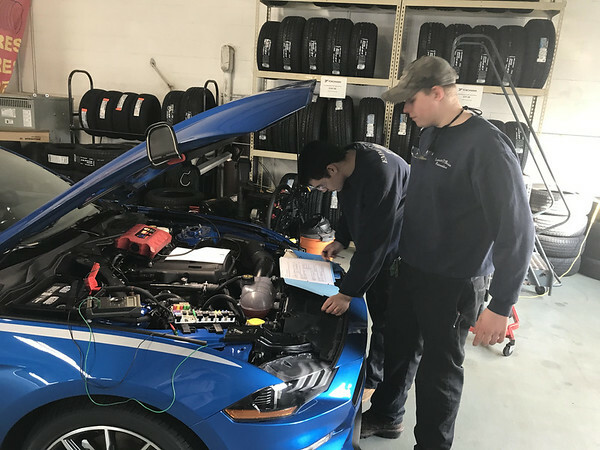 Tom Mangum, who said that he is a semi-retired technician at Crowley Ford, worked with Hunter Us and John Peabody from Emmett O’Brien Technical High School in Ansonia under the hood of a car. They had a circuit chart, which helped them to diagnose three problems with the car. One of them was a broken wire, which they were able to identify. Another was a problem with the car’s heater. Mangum said he worked for Crowley for 25 to 30 years and also served in the U.S. Navy and was deployed to Vietnam from 1968 to 1972. Posted in The Bristol Press, Bristol, General News, Plainville on Tuesday, 5 February 2019 19:49. Updated: Tuesday, 5 February 2019 19:52.